Easter is one of our favourite celebrations of the year, and no Easter should be complete without a mouth-watering Easter Cake. At Cakes by Robin, we have years of experience in designing exquisite, bespoke cakes for every occasion. We are a London cake company with a passion for originality, creativity and deliciousness! Our beautiful cake designs are perfectly tailored to your requirements – the only limit is your imagination. Why not take a look at our Gallery for inspiration? Feel free to let us know your ideas for a tempting celebration cake or novelty cake and we will work with you to achieve a truly stunning result. We have a wide range of delectable Flavours and Fillings to choose from to make your Easter Cake extra scrumptious. From a classic Vanilla Victoria Sponge to Lemon Drizzle, Sticky Toffee, Red Velvet and beyond, you’re bound to find your favourite taste. 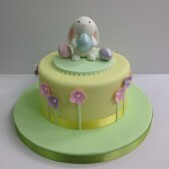 Cakes by Robin can cater for any special dietary requirements, including Gluten Free Easter Cakes. We firmly believe that there is no reason whatsoever why you should miss out on a heavenly slice of cake on account of your food sensitivity or intolerance. Designing our Easter Cakes from our studio in South West London, we can create designer Easter Cakes to order and have them delivered directly to you. We deliver free of charge within the London area. 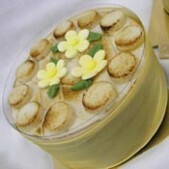 Visit our Cake Delivery page for further information.